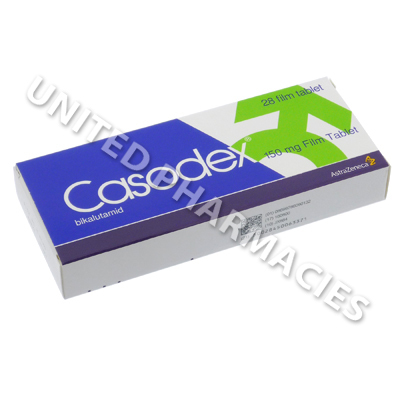 Casodex (Bicalutamide) is used to treat patients suffering from prostate cancer. This medicine belongs to a group of drugs called anti-androgens, and it works by inhibiting the ability of testosterone to bind to the androgen receptors on the cancerous cells. 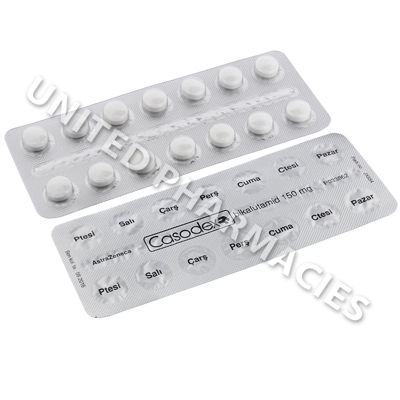 Casodex (Bicalutamide) is used to treat patients suffering from prostate cancer. This medicine belongs to a group of drugs called anti-androgens, and it works by inhibiting the ability of testosterone to bind to the androgen receptors on the cancerous cells. This prevents the growth of the cancer cells, as they require testosterone to grow. As a result of this, the tumour shrinks. The 150mg tablets are prescribed to treat prostate cancer which is locally advanced, when there is a risk of the cancer progressing, and for patients whose cancer has not spread when surgical castration or alternative treatments are not possible. Your doctor will tell you how much Casodex (Bicalutamide) tablets you need to take, as well as whether you should take the 50mg tablets or the 150mg tablets. In some cases, adult patients whose doctor felt it necessary to prescribe the 150mg tablets have been told to take 1 tablet per day. However, the 150mg tablets are not meant to be taken continuously for at least 2 years (or until the disease has started to progress). While you are being treated with this medicine, it is strongly recommended that you notify your doctor if any side effects are noticed. In some instances, serious side effects which require urgent medical care may occur, such as bloody urine, swelling of the feet or hands, fever, bruising, low energy levels, as well as other reactions which have not been listed here. While you are taking this medicine, it will be necessary for you to attend regular medical appointments, to monitor your progress. It is essential that you attend any scheduled tests or check-ups required by your doctor. This medication is not to be taken by women. Pregnant women are advised not to handle the tablets, so as to avoid accidentally absorbing the active ingredient through the skin. If this occurs, it could harm the unborn baby. Always use Casodex (Bicalutamide) as you have been prescribed by your doctor. Never self-medicate or change your dosage without first consulting your doctor. The correct dosage can vary depending on your health, medical history, and the severity of the condition being treated.